Svitlana brings with her an unparalleled passion for helping her clients and is always a knowledgeable source to turn to for the latest real estate trends and happenings. 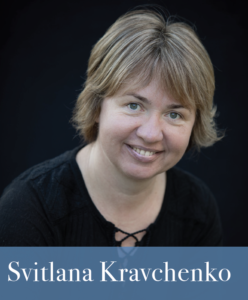 Prior to diving into the world of real estate, Svitlana was an ESL teacher for over 20 years and taught students both in the United States and Ukraine. Speaking three different languages (English, Ukrainian and Russian) and living in vastly different cultures has taught her to appreciate, connect with and serve a large clientele. Svitlana always has her clients best interests in mind and works hard each and every day to ensure that they have a happy and successful real estate experience. Her energetic spirit, strong work ethic and love of people make her a one-of-a-kind agent. Svitlana received an MA in Economics and Philology. Please fill out the below information and Svitlana will be in touch with you shortly! "It was a great experience working with you and your team. I greatly appreciate your honesty and integrity and also your generosity and kindness. continued"